(1862-1894) was a French painter born March 17, 1862 in Paris and who died April 27, 1894. He is associated with the Synthetic movement and Pont-Aven School, and he was a contemporary and friend of Paul Gauguin and Vincent van Gogh. Gauguin created a portrait of him in 1886 looking at one of Gauguin's Ceramic sculptures, entitled "Still Life with Profile of Laval". 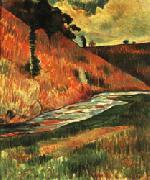 Paul Gauguin and Laval both came to Pension Gloanec in Pont-Aven in 1886 and became friends. In search of an exoticism that could provide the key to art, Gauguin and Laval went to Panama in 1887. To gain some subsidies, Laval performs academic portraits (all lost), using his experience received from Leon Bonnat. A series of mishaps caused Laval and Gauguin to leave the Central America for the island of Martinique.